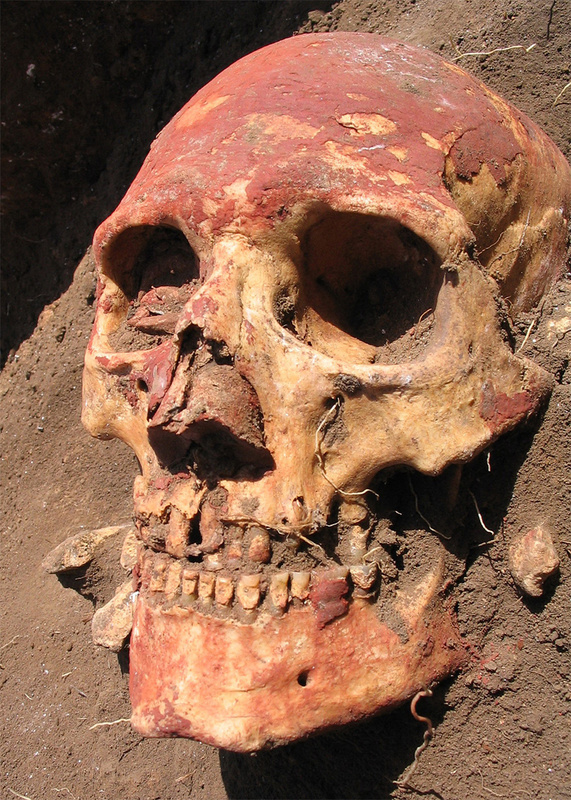 This Yamnaya skull from the Samara region, north of the Caspian Sea in Russia, was colored with red ochre. After an unprecedented genetic analysis of ancient human specimens from Europe and Asia, archeologists have pinned many modern genetic and linguistic patterns across the region on the Yamnaya, a poorly known population that originated in Central Asia. The study explains a number of mysteries, says corresponding author Eske Willerslev of the University of Copenhagen. What were the major influences for the broadest genetic patterns in Eurasia? Were the massive economic and cultural changes during the Bronze Age due primarily to the movement of people or of ideas? Why do so many people across Europe and Asia speak the related "Indo-European" languages? Why is the globally rare ability to drink unprocessed milk so common in Northern Europe? Good results require good data, and Willerslev says the group used new methods to extract human DNA while excluding the microbial DNA that contaminates it. "After death all parts of the body are filled up with microorganisms, so in the range of 95-99 percent of DNA is not human." To address their questions, the research group sequenced the genomes of 101 individuals from Europe and Asia during the Bronze Age (5,000 to 2,000 years ago). That was about five times the previous number of archeological genome sequences from the region, Willerslev says. The genetics proved that "the Bronze Age involved massive population movement, so there is no doubt that these cultural changes also involved the movement of people," Willerslev says. The Yamnaya originated in the northern Caucasus, and spread into central and northern Europe, where they mixed with locals. At the same time, they also spread into central Asia, to western China, southern Siberia and Mongolia, Willerslev says. "This fits beautifully with the distribution of the Indo-European languages, and it's very tempting and reasonable -- there is no direct proof -- to argue that the Indo-European language spread with the Yamnaya people." During the Bronze Age, the human genetics of northern and southern Europe diverged, mainly due to the arrival of the Yamnaya in Northern Europe, on a route that bypassed Southern Europe. Migrations during the Bronze Age by and large created the current Eurasian genetic picture by 2,000 years ago, Willerslev says. By then, "the genetic landscape resembles to a large extent what we see in Europe and Asia today. But in the early Bronze Age, it does not. The majority of genetic differences, the distribution of people that we see in Central Asia and Europe today, were set during the Bronze Age." The biggest surprise was in Central Asia, where four population replacements occurred in just 3,000 years. "It's the most dynamic place I have ever heard about in human history," Willerslev says. "It's quite mind blowing." It's uncertain whether any close descendants of Yamnaya remain in central Asia, Willerslev says. "This remains to be investigated. In northern Pakistan, you do have people with very blondish hair and blue eyes who might be descendants of the Yamnaya, or of other Europeans who entered central Asia during the Bronze Age, but this is speculation." These barrows, built from about 3,500 to 3,100 years before present, are typical of Bronze Age barrows in Denmark. Barrows were built by ancient cultures to bury the dead or for other ceremonial purposes. The upheaval that followed the arrival of the Yamnaya in Central Asia may have exceeded the transformation that followed European colonization of the Americas. "The Central Asians were hunter-gatherers who had stone tools and weapons," Willerslev says, "and the Yamnaya suddenly came in with horses, wagons, wheels, bronze weapons instead of stone. They are bringing in completely new technologies." 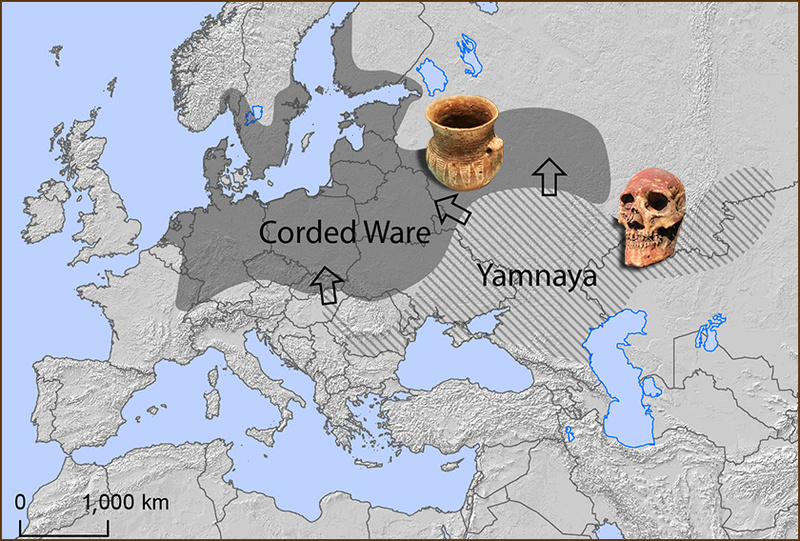 The "corded ware" cultures of northern Europe were influenced by the arrival of Yamnaya immigrants starting about 5,000 years ago. 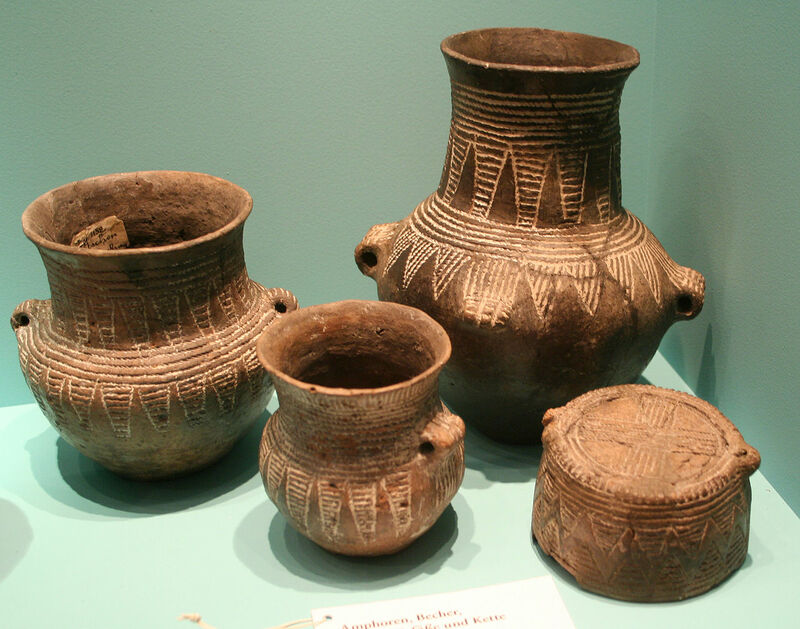 This corded-ware pottery in the Museum für Vor- und Frühgeschichte (Berlin), from about 2500 BC. The Yamnaya's effects were less striking in northern Europe, which was already populated by farmers, Willerslev says, "but the Yamnaya did change the way they buried their dead, changed the material they used for creating tools and weapons, and the type of housing and family structure." And they may have brought the gene for the enzyme that digests lactose, the sugar in milk. The new genetic study indicates that the migrants were breeding with the residents in northern Europe. In contrast, changes in central Asia during the early and middle Bronze Age were "extremely abrupt," Willerslev says, "and could be due to war, disease or climate change." The broadest goal of the study was to shed light on how technology and culture spread, Willerslev says. "This has been a big debate with two extremes. On the one hand, you have people saying this was all due to the transmission of ideas, not human movement. At the other extreme, archeologists say it involved really massive people movements. Our data is in agreement with the latter." The Yamnaya shaped the very way we are communicating about these events, Willerslev says. "The Indo-European language was a Yamnaya invention, and it spread with them. They were genetically successful in the early Bronze Age, 5,000 years ago. At that time, we would talk about them as we talk about the Chinese today, spreading across world very successfully."